You ensure your operation with maximum visibility and thus an optimal recruitment! A simplified configuration and an unbeatable ROI thanks to the Like a Bird platform! You can create your Follow & RT manually on the Twitter web interface or on TweetDeck and use a free online random draw software. The Follow and RT made by Like a Bird might be the best solution to meet your needs! Additional function: the “Mandatory Follow”. By activating this option on the platform, a tweet is automatically sent to non-followers participants to ask them to follow the relevant account. Edit your operation throughout its duration: the participation rate is falling? Plan one or more reminder tweets to benefit from maximum visibility! Recover the data from all of your participants has never been easier! By activating the “Second Chance” option, a message is automatically sent to all your participants asking them to fill a form. The option is configurable directly on the platform. 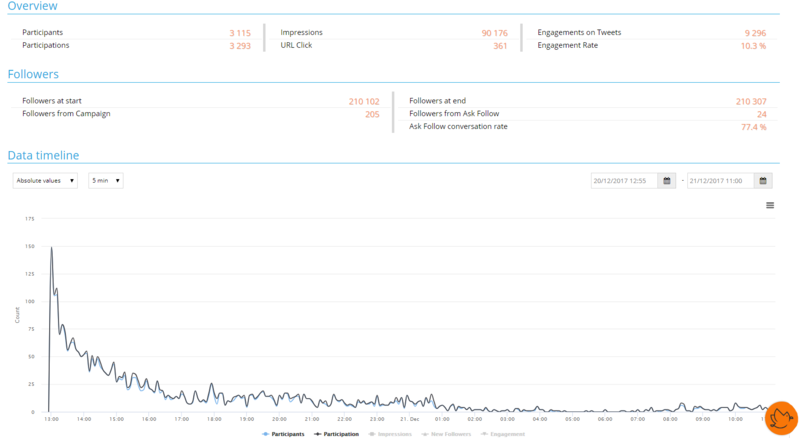 A real time tracking of your operation’s statistics: number of new followers, evolution of participations (…). You also have access to a pre-configured file for Twitter Ads that you will only have to upload to the Twitter platform to create a personalized audience. Thanks to our anti-cheaters algorithm, you will be able to remove all of the unqualified accounts from your potential winners’ list! Draw as many winners as you want with one click! Collect your winners’ email addresses and other data by DM, directly configurable on the platform, then plan a mass mail with one click. A link to a secured data collecting form will automatically be linked to this DM.